Under counter replacement water filters are available in Heavy Metal Reduction, Standard Carbon and the Mini under counter replacement water filter range has a Lime Scale Inhibitor water filter. The replacement models of our under counter water filters are supplied with 1/4" push fittings as standard but are available with 6mm, 5/16", 3/8" & 10mm fittings as an extra option to fit other types and makes of filter systems. Our replacement under counter filters are WRAS (water regulations advisory scheme) certified. This means the filters comply with the regulations and will not add anything harmful to the drinking water. Improves the taste and odour of the drinking water, reduces chlorine, toxins, fluoride, assorted herbicides & pesticides as well as dealing with a wide range of heavy metals such as lead and many, many more. This top of the range filter system is also effective against nitrates. 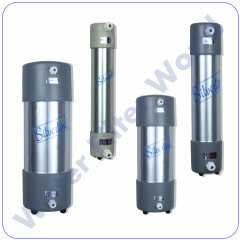 The replacement under counter filter models are available in different sizes & replacement frequency to suite your needs. A pressure protection valve should be fitted before the under counter filters to protect from pressure surges that may cause damage to the filter. Under Counter Standard Carbon Replacement Water Filter For UC12S Water Filter System. Replacement Water Filter To Improve Taste And Odour Of Drinking Water. Under Counter Standard Carbon Replacement Water Filter for UC40SWater Filter System. Improves Taste And Odour Of Drinking Water. Sutible For Larger Households And Small Offices, 40000 litres Or 2 Years. Under Counter Standard Carbon Replacement Water Filter For UC60S Water Filter System. Improves Taste And Odour Of Drinking Water Suitble For Larger Families / Small Ofices Or 60'000 litres. Under Counter Heavy Metal Replacement Water Filter. Reduces Heavy Metals And Improve Taste And Odour Of Drinking Water. Under Counter Heavy Metal Reduction Replacement Water Filter. Reduces Heavy Metals And Improves Taste And Odour Of Drinking Water Suitble For Hoseholds of 3-5 People Or 27'000 litres. Under Counter Heavy Metal Reduction Replacement Water Filter. Reduces Heavy Metals And Improve Taste And Odour Of Drinking Water. Sutible For Larger Households And Small Offices, 40000 litres Or 2 Years.